I'm guessing they met at yuracheks house? Chaney is in second pic with read Nike beanie on talking to Muss. Why is everyone so down on Musselman's recruiting? Just because he has a limited track record at Nevada? Hell, I think it's overrated currently. If you get great recruits, they gone. That's why we've seen the parity in basketball recently. The top schools are full of one and dones. Can't build a team. It works sometimes if they don't leave, and the ones trying to be one and done do their own thing and don't give a shite about the team. I'd like to see a coach approach things differently. Of course go for big talent, but focus on a base of solid, hardnosed kids you know will be here 3-4 years. 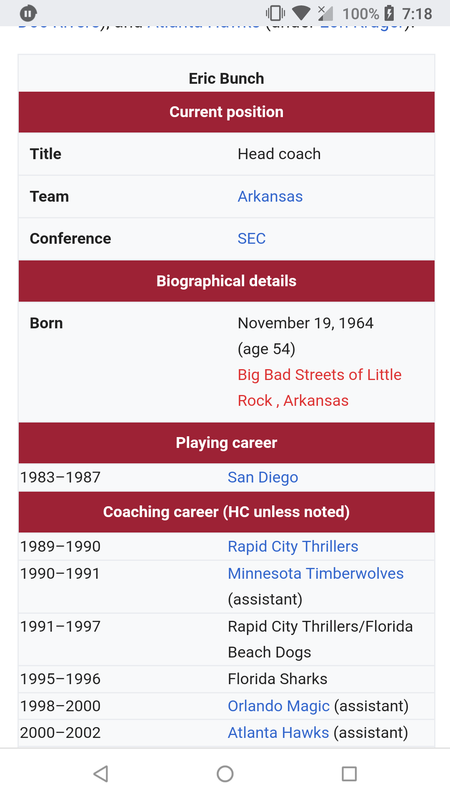 I'm pumped about the hire. Love the NBA experience. Feel he'll get the most of out the talent we have; hope he can build it up with recruiting. His wife's hot. Interesting tidbit from Trey as he’s spelling out how the search went down. 4. If you noticed in the video where Eric Musselman addressed the Arkansas team, he said he had broken down everything with regard to each player on the team. When did he do this? Certainly not the span of a few days. No, when he and Hunter Yurachek met, Musselman had already done a statistical and performance breakdown of the entire team and every player and had a plan for how they were going to address the holes on the team. 5. This moment where Yurachek first met with Musselman, I believe, is when it came full circle for Yurachek. It went back to his last meeting with Mike Anderson. Yurachek wanted answers for how they were going to improve and get things right and Anderson had no answers and almost seemed unprepared. Then he met with Musselman and Musselman had those answers. Anybody got a video link to the afternoon presser? I'm sure it will be posted soon. I'm so excited. Every one should go watch 7 minute video of team meeting razorback Twitter page. Plus, his wife is hot, and his daughter is so adorable. Anyone else here at Bud Walton? I'm sitting toward the back with a razorback shirt on. No, but make sure you howl when you do the Hog call so we know where the idiots in the crowd are. He's 2020 but may reclassify. Kansas also just offered. This the press conference thread now? About time they turned the lights on. Looks good with the cardinal tie.